Everybody wants to hit the Big Name Iconic State and National Parks. It seems many people's bucket lists always start on the "left coast." Don't get us wrong, we do enjoy or want to experience the likes of the La Bea Tar Pits, Yellowstone and Redwood National Parks and a slew of others out west. We just strongly feel people should show some love for the City, State and National Parks on the East Coast. From Maine through Florida, there are some awesome opportunities to see the beauty that draws millions from around the world to the United States. Acadia National Park Bar Harbor, Maine - Hike Cadillac Mountain, indulge in Jordan Pond Popovers, and eat at a lobster pound! Mount Washington State Park, New Hampshire - The summit of the Northeast's highest peak, surrounded by the extensive 750,000-acre White Mountain National Forest. Grand Isle State Park, Vermont - The location of South Hero Island on Lake Champlain is a place for quiet serenity. Cape Cod National Seashore Wellfleet, Massachusetts - Discover wild natural beaches, lighthouses, and wildlife. Watkins Glen State Park Watkins Glen, New York - Natural gorge carved seemingly artistically by the power of water. Ricketts Glen State Park Red Rock, Pennsylvania - Hike along over twenty-two beautiful waterfalls. Hopewell Furnace State Park, Elverson, Pennsylvania - The history of iron in early America. Check out neighboring French Creek State Park for fishing and boating too! Fairmount Park, Pennsylvania - Woven through the city of Philadelphia, this park is one of the largest urban park systems in the United States. Delaware Seashore State Park - Experience miles of ocean and bay shoreline. The park borders the Atlantic Ocean to the east, and Rehoboth and Indian River Bays to the west. Assateague Island National Seashore - Catch sight of two herds of wild horses which make their home on Assateague Island, while still being close to a hip, cool seacoast town. Historic Jamestowne - Where John Smith first landed, and currently an active archaeological dig site. Shenandoah, Virginia - Features Skyline Drive and over 200,000 acres of protected lands. Cass Scenic Railroad State Park, West Virginia - Eleven mile long heritage railroad nestled in the mountains of West Virginia. Mammoth Cave National Park, Kentucky - The longest mapped cave system in the world..
Fort Fisher Recreational Area, North Carolina - Remote beaches and site of a historical naval engagement during the American Civil War, this park is also an important nesting ground for sea turtles. Huntington Beach State Park, South Carolina - One of the best preserved examples of South Carolina's natural coast. Red Top Mountain State Park, Georgia - While best known for the 12,000-acre Allatoona Lake, this state park is also a hiker’s haven. Great Smoky Mountains, Tennessee and North Carolina - Running the border of Tennessee and North Carolina, this homeland of the Cherokees offers fantastic hiking and a historical glimpse into the way of life of old-time southern Appalachia. Fall Creek State Park, Tennessee - Fall Creek Falls, at 256 feet, is one of the highest waterfalls in the Eastern United States. Weeki Wachee Springs State Park, Fla - Watch the live mermaid show, but be taken by the natural beauty found within this park. Jockey's Ridge State Park, North Carolina. - Discover the tallest sand dune on the Atlantic coast; and enjoy spectacular sunsets. High Bridge Trail State Park, Virgina - Rail trail that includes the longest recreational bridge in Virginia and among the longest in the United States. Biscayne National Park, Florida - Ninety-five percent of the park is water, and the bay shores are the location of an extensive mangrove forest. 172,971 acres includes the first of the true Florida Keys. Ponce de Leon Springs State Park, Florida - Home to the Fountain of Youth, 14 million gallons of pure water emerges daily from the Ponce de Leon Spring. Florida Caverns State Park, Florida - Only state park in Florida to offer cave tours to the public. 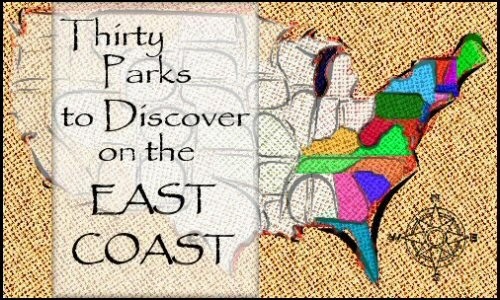 Did we miss your favorite East Coast Park? Know something cool about one we did mention? Share your favorites and what makes them unique in the comments section below!